With SAP Jam Collaboration we want to provide collaboration to everybody, no matter where they currently are. Because the easier it is for people to work with their colleagues, independent of time-zones, locations or devices, the faster your organization will achieve their business results. 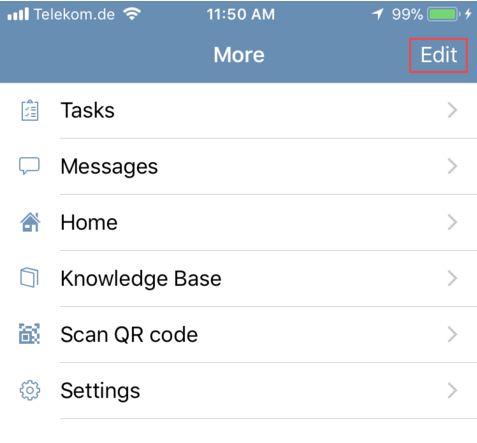 Therefore there are native mobile apps available for SAP Jam for both iOS and Android. With all its capabilities that SAP Jam offers by now (modern intranet, collaboration groups, task, knowledge base, real-time messages etc.) it’s essential that every user can customize their mobile app to fit the best for their main use cases. For example, a field service engineer might want to be able to first get access to the company knowledge base, a sales rep might want to get to his account mgmt and deal room groups as soon as possible, or an employee of your finance department will want to access the intranet as their default home page. In this blog, I’ll describe how every user can customize the layout of their mobile app to their personal needs. By default you see the buttons “Feed”, “Groups”, “Notifications”, “Profile”, and “More”, with Feed being the first button on the left which is opened when launching the mobile app. The “More” button always provides you access to all the capabilities that didn’t fit into the button row at the bottom. So even if you personalize your buttons, you will still be able to access all groups, documents, knowledge base articles and so on. To customize the buttons and its order click the More button, then click the Edit button in the top right. Now you can rearrange the icons on the bottom and if required replace them with icons that are available also at the top. For that just drag and drop them where you want them to be. For example, click on the Notifications icon in the button bar and drag and drop them onto the Feed icon on the left. This will replace the Notifications icon with the Home icon now. With this approach you can exactly customize the button row as you like it. Once you have personalized the buttons to your needs click the “Done” button in the top right to save your settings for the future. 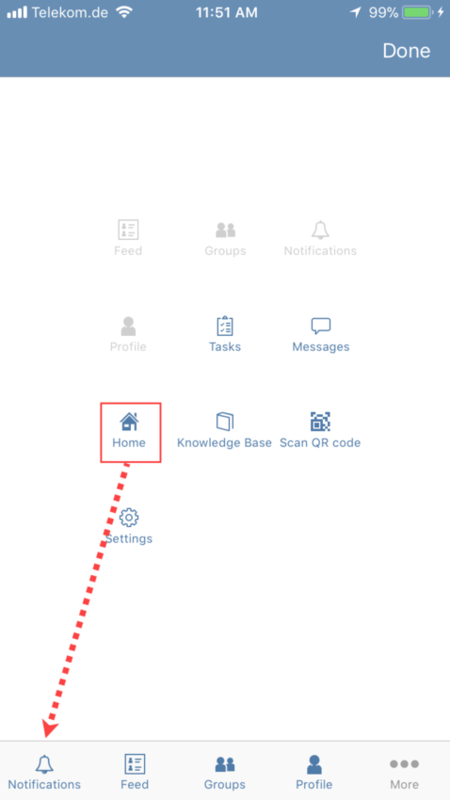 For myself I put Home, Notifications, Messages, and Groups into the button row to always have access to the intranet home page and my collaboration groups, and to not miss any notifications or messages. How does your app look like? What capabilities are you using the most in your SAP Jam Collaboration mobile app? How have you arranged your buttons? How does your app look like? Have you maybe branded your mobile app? Let me know and leave a comment. And maybe I’ll write another post on how to change the colors on the mobile app soon. Christian… Excellent blog! This capability is one that our customers are asking for so we’re very happy you have shared the best approach to personalize the mobile app and especially make “Home” the default.